The sun shone onto the narrow alleyways creating rectangular shadows on the ground. The pastel colours of the high town houses in Mombasa’s old town reminded me of the ones from Phuket, which we visited earlier this year. The connection is pretty obvious - both were influenced by the Portuguese. Mombasa was visited by Vasco da Gama in 1948, and since then the city was attacked by the Portuguese multiple times throughout the coming centuries. It then struggled with the reign of Omani Arabs, and eventually with the British. Kenya, and at the same time Mombasa, became independent in 1963. Today Mombasa seems to be a bustling city, however we didn’t have enough time to explore everything it has to offer. Nonetheless, we spent a great day walking around the city, enjoying its sunny weather and receiving multiple smiles and ‘jambos’ from the locals we encountered on the way. Where to stay in Mombasa ON A BUDGET? We stayed in the suburb of Moja, in the actual island of Mombasa, in a cheap guesthouse called Karama. We can’t say we recommend it for longer than one night because the staff was especially not cooperative and the room wasn’t the best (it had a fan but no bathroom door and no toilet seat...), but for 15 USD a night for a room and with only 15 minutes on foot to the old town, it was alright. Another advantage (for those travelling by bus) might be the fact that buses to Nairobi leave literally from the front of the guesthouse. 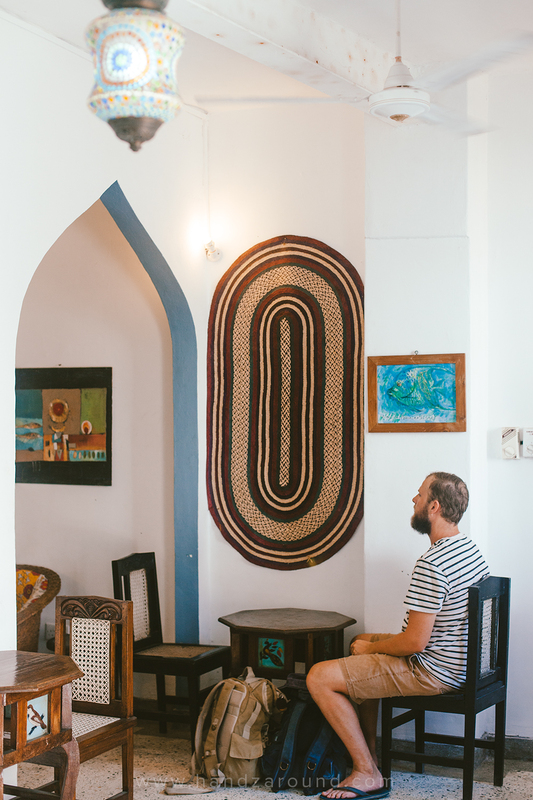 In comparison to other cities we have visited, we can’t say that Mombasa is in our high rankings and we definitely can’t say it has many awesome attractions, but we did really enjoy walking around the old town so staying where we did was quite suitable for us. First we visited Moi Avenue and the giant aluminium elephant tusks raised in the middle of the street to commemorate the visit of Princess Margaret in 1956. From there we headed to the Old Town towards Fort Jesus. Fort Jesus didn’t really attract us too much and we didn’t like that the price for the citizens equaled 200 KSH and for non-citizens 1200 KSH, so we skipped it for the sake of walking around, drinking coffee and people-watching. Somewhere left from Fort Jesus, couple of streets from the shore overlooking Mombasa Harbour, we found Africa Hotel - the first Hotel in Kenya, which opened in 1901. We got quite excited about seeing the old rooms and moving back in time to the 20th Century for a brief moment. We read on the door that donations of whatever amount are accepted - sounded like a good deal to us. 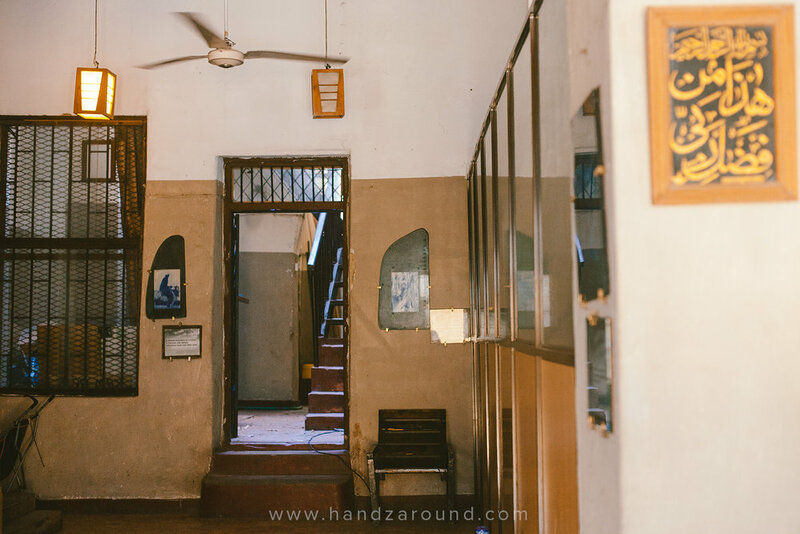 When the friendly owner appeared, he welcomed us inside and lead us through to the first room which was empty - just a few chairs, several old photographs hanging on the walls and a desk. He flooded us with the stories about the colonial history, Swahili culture, Muslim religion and Kenyan tribes and 15 minutes later we were done. To our surprise that was it - all that was left from ‘Africa Hotel’ summed up in several old photographs and interesting but very complicated stories. We handed him 300 KSH as a donation, to which he pointed to the sign somewhere near the entrance saying that non-Kenyan citizens pay 500 KSH per person… So that’s how we got rid of almost 10 USD and left quite disappointed. Where to eat and drink in Mombasa's Old Town? We walked around the narrow streets, deeper into the old town and spotted more and more delicious street food stalls on pretty much every corner. Samosas, bananas, mangoes, shawarmas, meat sticks… all fresh, cooked in front of you and wrapped in a newspaper for the price of 25 - 200 KSH (0.25-2 USD). Eventually we stumbled across Jahazi Coffee House, a local NGO serving snacks and coffee. Their pretty decor attracted us inside. The Swahili coffee served in a small pot for 100 KSH was really nice and it was nice to peek through the door onto the street on the colourfully dressed locals, but if you do go there, don’t order snacks - spare you shillings for the samosas from the street, they’re cheaper, bigger and tastier. We kept walking past the nearby fish market towards the Basheikh Mosque. The old school adverts painted on the pastel walls of the buildings took us back in time to the 1950s and 1960s. The sun created patterns on the ground, projected from the metal bars placed in the windows and the children screamed happily running around with the ball. Occasionally there would be a tuk tuk honking at us to get off the way, and the smiley old lady would wave to us from her doorway. The old town might have had some nasty smells and the streets filled with rubbish, but we can’t remember the last time we had such a good time. We walked around in the sun taking photographs, nobody bothered or harassed us, there were no other ‘muzungus’ in sight and our bodies were fuelled with delicious samosas - we didn’t need much more to be happy. So, to the next time Mombasa! This article contains affiliate links to Booking.com, which means that if you book any hotel on their website using our links, we'll earn a small commission fee. You will not pay more than if you had booked it in a different way, and we will get a small commission to keep us going and writing more useful articles for you! All the opinions in this article, as always, are ours. Did you like it? Pin it for others. Choose the design you like!